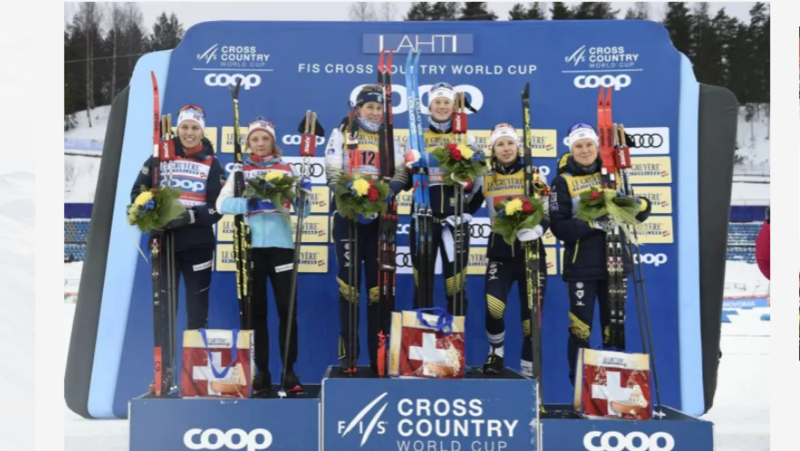 It was a weekend of sprinting in Lahti, Finland, with many World Cup athletes closing out Sunday having traversed the famed 1.4-kilometer 2016 World Championships sprint loop at top speed close to ten times. By the time Sweden’s Maja Dahlqvist got on course for the final lap of the women’s classic Team Sprint, she had already tallied nine–in Saturday’s freestyle sprint she made it through the qualifier, quarterfinal, semifinal and final (placing third), and on Sunday, she and teammate Ida Ingemarsdotter had to first complete in the 6 x 1.4 k semifinals to advance to the 6 x 1.4 k final. Through the first two thirds of Sunday’s final, it appeared the extra kilometers had worn on the Swede. She and Ingemarsdotter remained positioned in fifth or sixth through first four exchanges, watching from behind the pace of Norway’s Team I, Norway’s Team II, Russia’s Team I and Finland’s Team I. In her last leg and just before the final exchange, however, Dahlqvist’s teammate Ingemarsdotter made a decisive surge to the front. By the time Ingemarsdotter handed off to Dahlqvist for the race’s final sprint lap, only Tiril Udnes Weng of Norway’s Team I remained in front. Heading into the races final kilometer and half, Sweden’s Team I was positioned in second. If Dahlqvist was feeling anything in her legs from the weekend’s sprint series, it must have been motivation. She charged into the last sprint lap chasing down Maiken Caspersen Falla, the anchor for Norway Team I and the winner of Saturday’s skate sprint. In the end, Dahlqvist’s press proved too strong for Falla. She overcame the Norwegian and Sweden’s Team I crossed first in a time of 18:24.96 for the win. Falla crossed 1.84 seconds behind to put Norway Team I in second place. Claiming third place, 3.55 seconds back from the winners, was Sweden’s Team II of Evelina Settlin and Hanna Falk. With World Championships just around the corner, the U.S. entered two teams in the sprint: USA I was comprised of Ida Sargent and Sophie Caldwell. The two women raced the first semifinal and finished outside of advancing to the finals, placing 12th overall. Sargent and Caldwell have partner up in the past and landed on the podium–last year in Dresden and two years ago in the Pyeongchang World Cup–so making it into the final and onto the podium had been in the back of their minds. “Classic team sprint I think is my favorite race so I was really excited for today but unfortunately it didn’t go as well as we hoped” Sargent wrote in an email. Sargent cited the pace of the semifinal as unlike team sprint semis that she has scrambled for in the past. Kelsey Phinney and Julia Kern were entered as USA II and placed 14th overall. The duo placed seventh in their semi-final. Resources were stretched a little thinner this weekend in Lahti due to the simultaneous USST pre-World’s training training camp in Davos, Switzerland. U.S. World Cup coach, Matt Whitcomb indicated that he helped with skis on Sunday and because of that role, spent most of his time waxing instead of on course. “While it was definitely a disappointment not to have any teams advance through the semis today, we did see a lot of athletes ski really well,” Whitcomb said during a phone conversation. “Unfortunately, Ida struggled a little bit with her skis and Simi struggled with his glide. … Sophie and she felt like she had really awesome skis and felt really good, so she has returned from her trip home very strong,” Whitcomb continued. Caldwell recently returned to the U.S. to spend time with her mother. Athletes will remain in Finland for two days before heading down to Cogne, Italy on Wednesday for the final World Cup races before World Championships in Seefeld, Austria.